The regional centre of Nowra, situated on the beautiful Shoalhaven River, is a major town on the New South Wales south coast and is close to the many popular natural and cultural features of the Shoalhaven and Southern Highlands districts. Nowra's bustling commercial centre belies the pleasant laid back lifestyle enjoyed by locals. Visitors receive a very warm welcome to Nowra. Nowra is the region's commercial and administrative centre. Nowra hosts a major rural business district and a diverse population in its suburbs and myriad satellite villages. Many local, state and federal government offices service the region from here, including the Shoalhaven City Council, the local council responsible for the administration of the region. The major industries around Nowra include tourism, manufacturing and the presence of the Australian Navy. The history of its fleet air arm is well represented here. One of the cultural delights of Nowra is nearby Bundanon, the rural property of the late Arthur Boyd which he gave to the nation to be used as a retreat for artists. It is open to visitors on the first Sunday of each month. Bundanon is a spectacularly beautiful property on the banks of the Shoalhaven River and was the inspiration for many of Boyd's most famous paintings. Arthur Boyd is seen here, content at the easel in the natural beauty of Bundanon. 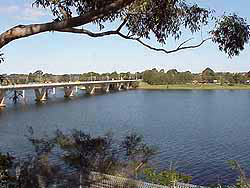 The lazy expansive Shoalhaven River flows under the bridge at Nowra on its way to the coast at Shoalhaven Heads. 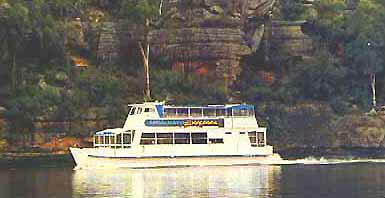 River cruises, photography and fishing are some of the popular experiences on this beautiful and precious waterway. The appreciation of the Shoalhaven River can not be bettered than by a trip on its waters. Its banks merge from picturesque, gentle rural flats to sheer rock faces breathtaking in their colour and ruggedness. This river is not be taken for granted. The river is seen here at dawn, meandering to the Pacific coast past nearby Mount Coolangatta, which lies between Nowra and the Shoalhaven Heads. Nowra's adjoining town of Bomaderry is the southernmost coastal link to the NSW rail system from Sydney. The population of Nowra / Bomaderry is around 25,000, enhanced by the number of service men and women based here. 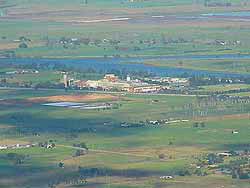 The town is divided by the river running east to Shoalhaven Heads, and by the Princes Highway running north south. Historically the area has relied on timber, wheat, wool and produce industries and today supports tourism, local government, naval bases, manufacturing, dairying, paper and starch mills and more. There is an extensive range of accommodation alternatives in and around the Nowra-Berry-Kangaroo Valley-Jervis Bay region. You can choose to stay in a rural retreat, on the beach or closer to the middle of town and its own attractions, in a quality motel. Many caravan parks, motels, hotels and guesthouses are available for the tourist. Backpacker accommodation is also available around the area. Along with our district's many wonderful natural attractions, Nowra itself provides an extensive selection of entertainment for all ages. Live entertainment is found at local clubs, hotels, halls and schools. Cinemas offer the latest releases and touring circuses pitch their colourful big tops throughout the year. Many community festivals and events are also held during the Shoalhaven's busy entertainment calendar.